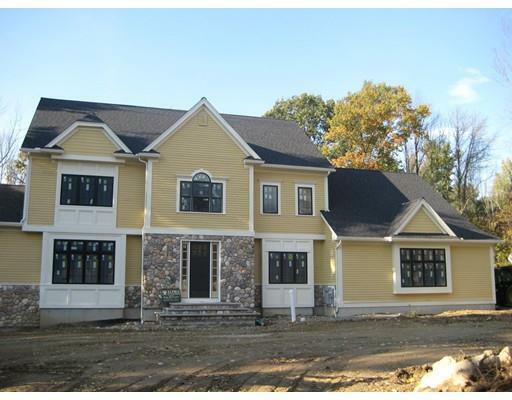 NEW CONSTRUCTION ON CENTRAL STREET CLOSE TO PHILLIPS ACADEMY & DOWNTOWN ANDOVER! PREMIER LOCATION, BEAUTIFUL SETTING & OUTSTANDING FLOOR PLAN OFFER RARE OPPORTUNITY TO OWN A NEW HOME CLOSE TO ANDOVER CENTER. 59 CENTRAL STREET OFFERS THIS & MORE! Stunning kitchen w/custom cabinets, gorgeous butler’s pantry, breakfast bar & dining area opens to expansive, fireplaced family room. Dining Room with wainscoting detail & chair-rail, gas fireplace & beamed ceiling. 1st floor guest suite/au pair/home office w/ separate entrance & private patio. Exquisite master suite w/luxury bath & walk-in closet. 5/6 BEDROOMS, 5.5 BATHS. Special features include bamboo floors throughout, 2 gas fireplaces, mudroom, 3rd floor perfect for teenage recreation room, flexible floor plan & 4 CAR GARAGE w/garden shed. 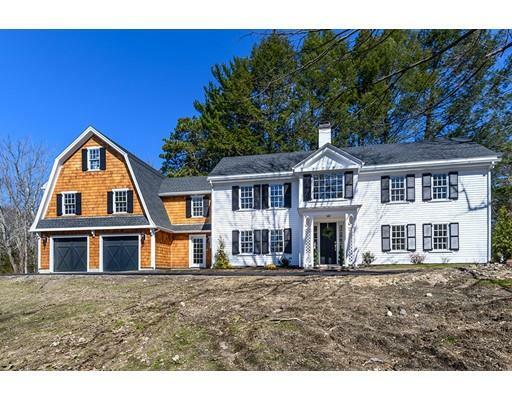 RARE FIND ON PRISTINE ACRE LOT, WALK TO TOWN & TRAIN TO BOSTON. OPEN HOUSE SUNDAY 1-3pm. Beautifully designed & crafted by well-known custom builder with attention to detail throughout. This stunning 11 room home is finely appointed in a private retreat like setting. Entering the home through a grand 2 story foyer you are guided into the formal dining room & living room with built in cabinets.. Gourmet chef's kitchen and butler's pantry is a cook's delight. Luxury master suite is truly a slice of heaven! Second floor includes additional master suite, 2 more bedrooms, bath & bonus room. For entertaining, this home boasts a picturesque heated gunite pool, spa & waterfall, outdoor kitchen, cabana featuring a wood-burning FP & bath and then your own tennis court - a beautiful outdoor oasis! This luxurious property is surrounded by manicured gardens & specimen trees bordering over 100 acres of conservation land and a two story barn. A separate 3 car garage offers an upstairs office/au pair/studio w/ kitchen & full bath.This home leaves nothing off your “must have” list! Magnificent custom built modern colonial ideally situated at the end of a quiet Middleton cul-de-sac. This estate is set on one acre of beautifully landscaped grounds in the desirable Masco School district and centrally located right off I-95 near The FernCroft Country Club. Meticulously crafted to offer a flowing floor plan, comfortable living, and the ultimate entertaining experience and 1800 SqFt in-law or au pair suite, a hand-build bridal staircase, custom built full bar and lounge on the lower level, a theater room with acoustic wall finishing. Kitchen features SS equipment, waterfall quartz counters with center island and modern cabinetry. Custom woodwork is spread across this home. 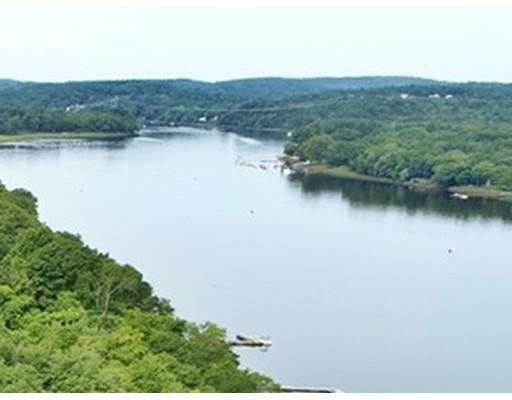 Enjoy all the nature and amenities while still being a close commute to Boston. This prestigious home in one of the most desirable neighborhoods on Boston’s North Shore will surely serve to make lasting memories. The 6,068 SQFT LA does NOT include 2 Sun Room + 2,085 SqFt Finished basement. Private luxury seven acre estate with 3 bedroom family/guest wing. Three beautifully finished floors with elevator access.The main floor features a gracious chef's kitchen with large eating area & upscale appliances. It opens to a screened porch. The impressive, fireplaced great room offers custom cabinetry, & access to the sweeping deck. The second floor's luxurious ensuite master bedroom includes a custom designed bath & private balcony. A large paneled office & another ensuite bedroom plus main laundry complete the second level. The finished walkout lower level offers a spacious bonus room with adjoining full bath. The guest wing features a light filled family room, bonus room with kitchenette, 3 bedrooms & 2 baths with separate laundry. Your family and guests will enjoy outdoor living in this special private retreat which includes a spectacular infinity pool, large stone patio and outdoor kitchen. 3+2 garages. 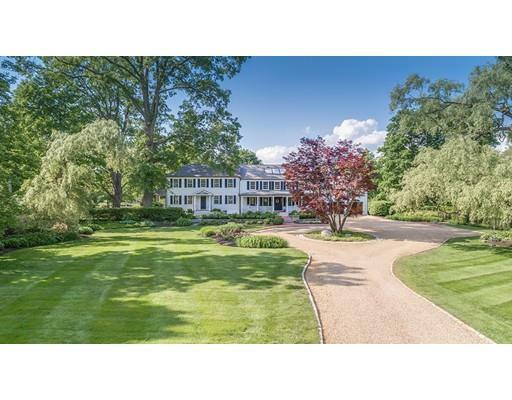 EXCEPTIONAL PROPERTY, OUTSTANDING LOCATION, UNPARALLELED SETTING JUST STEPS FROM PHILLIPS ACADEMY! Enjoy the ambience of this charming New England historic home w/exquisite seamlessly melded 5,000SF addition, featuring luxury amenities & finishes. SUPERB GOURMET KITCHEN w/custom painted cabinets, gorgeous chestnut island, maple pantry closets/desk area & 9’ banquette framing spacious dining area. GRACIOUS, EXPANSIVE FAMILY ROOM w/radiant heat, custom built-ins & gas fireplace w/Belgian bluestone surround. Triple French doors to incredible Renaissance-designed Conservatory overlooking private backyard. STUNNING MASTER SUITE w/vaulted ceiling & gas fireplace, luxury Calacatta Marble bath, dressing room & 2 walk-in closets. 1st Floor Guest Suite perfect for au-pair/in-law. Elegant multi-level bluestone patio & enclosed porch w/sunset views. BEAUTIFULLY APPOINTED PROPERTY, WITH SUPERIOR DESIGN DETAILS FOR THE SOPHISTICATED BUYER! INCOMPARABLE OFFERING IN SOUGHT AFTER ANDOVER LOCATION! 94 South Main Street is the ideal in-town country estate set on 5.6± acres in Topsfield with sport court (tennis and basketball), salt-water pool and pool house and apple orchard. The c1832 Colonial has been completely renovated with classic and charming features including a new chef’s kitchen with Viking appliances, wide pine floors, and floor to ceiling windows, and all new bathrooms and systems throughout. The home has 6,000± square feet with six bedrooms and three and one-half baths and a welcoming covered front porch. The addition of a solar panel field creates a cost-effective utility bill. The grounds feature expansive flat lawns, beautiful gardens, your own apple orchard and a various decks and patios for relaxation. The property is within walking distance to town and has easy highway access to the city of Boston.